You know when your curls are in a rut? Your old faithful products aren't doing the trick and the curls just are not popping like they used to? In times like this, you might want to consider a protein treatment. If you color treat your hair or use heat styling tools then all the more reason to work a protein treatment into your regimen. Depending on your hair needs, there are different types of protein treatments that perform different functions. If your hair is fairly healthy then you can treat your curls to a light treatment or protein pack once a month. For moderately damaged hair, choose a deep penetrating treatment twice a month. And if your hair needs some serious TLC then opt for a reconstructor, like the ApHogee Two-Step Protein Treatment. How can you tell if you need a reconstructor? Shake well before use! Keep out of eyes. If product gets into the eyes, rinse thoroughly with clean water. (The pH of ApHogee Two-Step Protein Treatment is about that of lemon juice and it will cause similar eye irritation). Apply ApHogee Balancing Moisturizer to hair and scalp. Leave in for 2 mins., then rinse thoroughly. Style as usual. When ApHogee Two-Step Protein Treatment is dried into the hair, the hair becomes extremely hard. DO NOT comb or brush hair while ApHogee Two-Step ProteinTreatment is dried and in the hair. The directions may sound unlike any you've seen before, but this is because this product acts unlike any treatment you've used before. Feeling apprehensive? Kami did too! 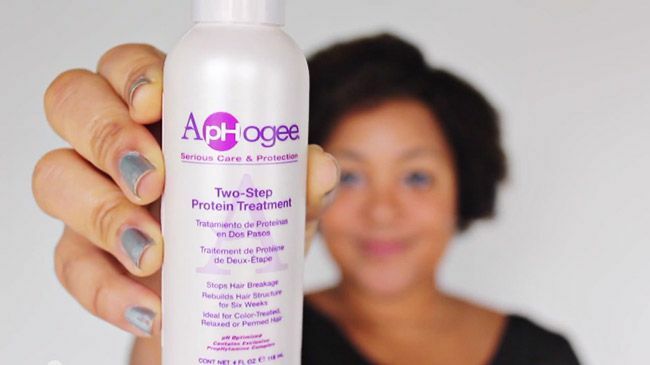 Watch her review to see how her experience with the Aphogee Two-Step Protein Treatment went on her Type 4 hair. Have you tried this protein treatment? What did you think? This post is sponsored by Aphogee.